The House is poised to set a shocking precedent of more spending, more debt, and higher taxes this evening. There are two main competing budgets on the House floor: one from the Budget Committee and one supported by the Armed Services Committee. Compared to last year’s budget, the Budget Committee’s budget includes $20 billion in additional “emergency” military spending that’s off-budget. This extra military spending isn’t counted toward the spending caps set in the 2011 fiscal deal that has modestly reined in spending over the last four years. The Budget Committee’s budget says that the new “emergency” spending should be offset by cuts to other programs. The Armed Services Committee’s budget raises “emergency” military spending by $22 billion, but unlike the Budget Committee’s budget, this budget eliminates the spending offsets. It doesn’t ask for any cuts to other programs. The Armed Services Committee’s budget lays the foundation for more spending from both parties, hundreds of billions of dollars of new debt, and tax hikes. If the House passes the Armed Services Committee’s budget tonight, we’ll have set the dangerous precedent that violating the 2011 budget deal and sequester are acceptable, that more national debt is just fine. We’ll have joined with Pres. Obama in obliterating even the pretense of fiscal responsibility. The votes on the Budget Committee’s budget (known as “Price #1”) and the Armed Services Committee’s budget (known as “Price #2”) will happen around 5 p.m. I will vote yes on Price #1 and no on Price #2. How will your representative in Congress vote? On Price #1, 105 Republicans voted AYE; 139 Republicans and 180 Democrats voted NO. Tom Reed voted NO. On Price #2, 219 Republicans voted AYE; 26 Republicans and 182 Democrats voted NO. Tom Reed voted AYE. Debt, government spending, and taxes are presumed bad. He doesn’t question the need for additional military spending. Additional military spending is ok if offset by cuts to domestic programs. He doesn’t object to keeping “emergency” military spending off-budget. You balance your budget and live within your means. Washington should do the same. The House GOP budget balances in less than 10 years without raising or creating taxes. Comparing the Federal Government to a family is nonsense. That the budget ought to balance is unjustified. That the proposed budget would balance as predicted is questionable. Tom Reed and Justin Amash share some concerns, but Tom is far less willing to explain himself. This entry was posted in Congress, Economics, Political, Reed's Views and tagged Budget, debt, government spending, Rep. Amash, Taxes. Bookmark the permalink. You are correct that comparing the government budget and a family budget is nonsense, but that is one topic that they do all the time. George Lakoff, in “The ALL NEW Don’t Think of an Elephant!” calls it Systemic Causation ( as opposed to direct causation, which you can actually see–like pushing a toy and it falls over) “Systemic causation cannot be experienced directly. It has to be learned, its cases have to be studied, and repeated communication is necessary before it can be widely understood.” Other topics that are Systemic Causation include Climate Change, smoking causes cancer and fracking causing earthquakes. They also it is difficult to explain them in simple buzz phrases like “raiding the retirement fund” to describe the way Social Security allocated worker’s deductions into the Disability Insurance fund when high unemployment provides less revenue for it. Most people have a life besides understanding the complexities of science or economics. . They don’t have the time nor the need to understand them. Using simple but false comparisons help politicians to frame the conversation to misinform. Is everything fair in love and war (and politics?) I don’t think so but a lot of people do. Lakoff, George (2014-09-23). The ALL NEW Don’t Think of an Elephant! : Know Your Values and Frame the Debate (p. 36). Chelsea Green Publishing. Kindle Edition. Catch phrases like “balance the budget” and “audit the Fed.” may serve to fool the public; when politicians hear them and repeat them again and again, they may fool themselves. It is very bad when decisions are based on groupthink. If Rep. Amash represented NY-23, he would have no need to hide his votes from right-leaning supporters as Rep. Reed, a Republican stalwart, does. When Tom explains his votes, he offends half of his constituents so he prefers to limit himself to platitudes. Rep. Amash, a conservative representing a very conservative district in Western Michigan, needs to explain and justify his extreme views to moderates. .
Family budget. Here’s 25 bucks for the week. You can buy food for your kid or bullets for your AK-47. We know what the GOP would do. Thanks for the vote count, it’s very interesting. 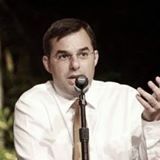 I believe Rep. Amash is a stalwart Libertarian, who caucuses with Republicans. Another Libertarian, Rand Paul, also eschews more military spending for war.